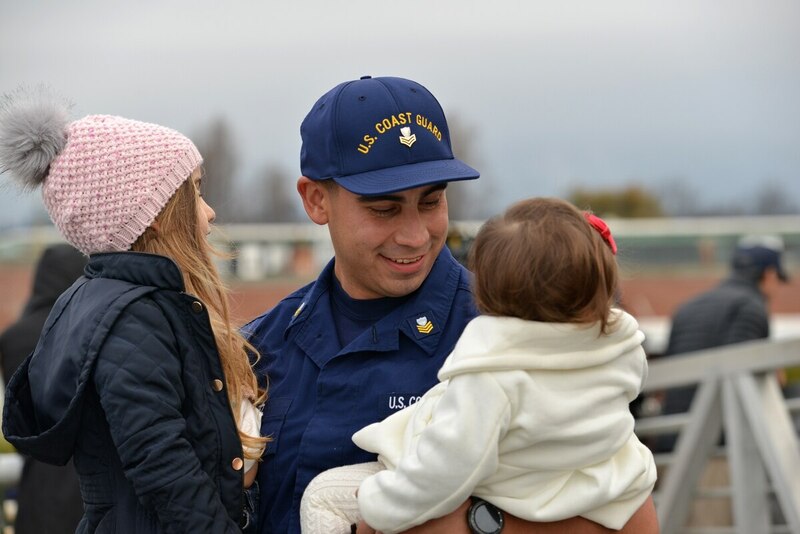 WASHINGTON — Petty Officer First Class Ryan Mleziva thought his financial worries were over when he joined the Coast Guard. Now, he and his fellow service members may be about to miss their second paycheck in a row. “My father was laid off several times while I was growing up. I went into this career because I wanted security,” said Mleziva, who traveled to Capitol Hill Tuesday on his day off to work with advocates on highlighting the impact of the ongoing government shutdown on Coast Guard families. Mleziva was part of a group of 30 service members, spouses and supporters who visited congressional offices to share their shutdown stories. Guard members missed their scheduled paycheck on Jan. 15, and need legislative action this week to guarantee they won’t miss their next one on Jan. 30. President Donald Trump announced Jan. 25 that he plans to sign legislation that would temporarily open government but does not include border wall funding. About 42,000 Coast Guard members have been required to work without pay since the start of the year, as the Department of Homeland Security operates on emergency orders because of the ongoing funding impasse between President Donald Trump and congressional Democrats. Members of the other armed services have not seen similar disruptions because the Department of Defense received its full fiscal 2019 funding last fall. Because the Coast Guard is funded separately through Homeland Security, its members haven’t been as fortunate. Both the House and Senate are considering separate bills which would allow the Coast Guard to be paid even if the 31-day-old shutdown isn’t resolved. But neither has made significant progress so far. Jon Ostrowski, national president of the Coast Guard Chief Petty Officers Association, said without action soon, another 50,000 Coast Guard retirees will also lose out on their next benefits paycheck at the start of next month. Michelle Alonso, a Coast Guard spouse who took part in Tuesday’s outreach event, said the uncertainty of the situation is draining families’ morale. “It’s not knowing how long this is going to last,” she said. “People are buckling down, going to food pantries, worrying whether they can pay for their kids sports, calling companies to get bills deferred and payments deferred. The House Speaker and President are at loggerheads over the shutdown; Pelosi had been scheduled to travel to Afghanistan. Fellow spouse Susan Bourassa said she worries too many lawmakers don’t appreciate the severity of that stress. Trump has insisted any budget deal include more than $5 billion for his controversial southern border wall plan. But congressional Democrats thus far have rejected all proposals that include that money, saying the president must allow the government to reopen before they negotiate on immigration policy. Roughly 800,000 federal workers have been furloughed or forced to work without pay during the government shutdown. In recent days, administration officials have been recalling additional personnel back to work to minimize the public effects of the shutdown, even though their paychecks remain frozen. Mleziva said he is looking into picking up a weekend job to help make ends meet. “I feel worst for my shipmates who are underway right now and don’t have that option,” he said. “These U.S. service members will sail halfway across the world to protect U.S. national interests while their loved ones try to cope with financial challenges at home in this unprecedented time,” he wrote. Mike Little, executive director of the Sea Service Family Foundation, which helped organize Tuesday’s lobbying event, said many service members who weathered the initial impact of missing a paycheck are starting to dread the coming weeks.